I’m in the mood to make some baskets. The cool fall weather we’ve been having these last couple of weeks is a reminder that it is almost time to harvest the grapevines… and it’s just a given that once I start cutting and coiling grapevines, some serious basket-weaving sessions won’t be far behind. 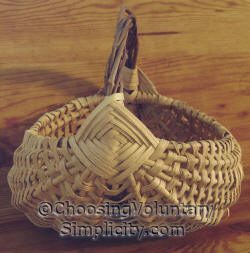 I actually learned the basics of basket-weaving years ago by attempting to make one of the most difficult types of basket. I had sent away for a kit that advertised “complete and easy to follow instructions” with “enough material to make one basket.” When the kit arrived, I followed the instructions exactly… I measured and wove, and when that didn’t look right, I unwove, remeasured and wove again. Nothing worked. It was a terribly frustrating experience, to say the least. The instructions didn’t seem to make sense. I didn’t know then that those almost indecipherable instructions were also very incomplete and that the kit did not include all the materials needed to finish the basket. I also did not realize then that most of the problems I was having were because the reed in the kit was old and brittle and almost impossible to work with. Regardless, I kept struggling on… and the funny thing is that despite the frustration, I was already hooked on basket-weaving and absolutely thrilled with the process. 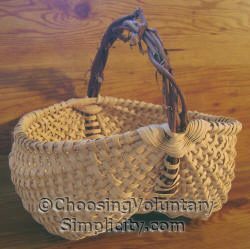 Eventually, my perseverance paid off and I started to actually understand basket-weaving… and I just wanted to learn more and make more baskets. I have never lost that feeling… creating a basket ALWAYS makes me feel happy. All the baskets in these photographs started with two grapevine hoops, or rings, with one ring positioned inside the other. The rings are lashed together at opposite points on the rim with decorative lashings. Ribs are then cut to size and inserted into the lashings to form the shape of the basket. I make the baskets freehand, without measurements or a pattern, and each piece is cut to fit as I weave. For a whimsical touch, I like to incorporate grapevines with curly tendrils into the design if I can. Although I start making a ring with a general idea of the basket size it will create, the curvature of the vines and their flexibility will determine the shape of the basket. I always feel that each basket shapes itself… and all I have to do is let my fingers follow along and fill in the shape that the vine has already determined. 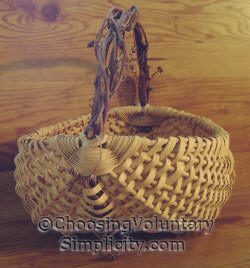 I have made dozens and dozens of baskets, but I don’t think I’ll ever lose that sense of wonder I feel with every basket at the point when the pieces of vine and reed suddenly transform into… a BASKET! What BEAUTIFUL baskets! You have quite a talent! I make use of baskets often in our home but sometimes, I just enjoy the beauty of the basket alone. Your baskets are AWESOME!! So beautiful. You are one talented lady. Btw I like the rest of your blog too. You do beautiful work!!!! I especially like the 2nd basket with the little curley tendrils. I wish I had some of your baskets to decorate with!!! Thanks for sharing. WOW! Just beautiful. Great blog also. It’s nice to find fellow weavers. I always say that weaving puts me in my “happy place”, a feeling we seem to share. I enjoyed reading your blog and will keep checking in on you. Your baskets are lovely. I, too, was bitten by the bug and this spring a generous on-line acquaintance is sending me lots of basket willow cuttings so I can begin my own “sally garden.” I collected lots of wild materials in the fall and I’m looking forward to finding the time to experiment with them. Like you, I find using various materials (vines and reed for baskets, yarn for knitting, beeswax for candles, oil for soap, etc., etc.) and creating useful “green” items to be truly satisfying. I’m going to make some of your oatmeal cookies now, but I’ll be back to visit! 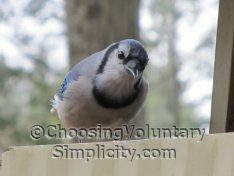 Thank you… you will love having your own willow supply. It sounds like we make some very similar things and find the same enjoyment in the process. I really appreciated all your lovely comments. Thanks for taking the time to write! You’re one of the multitude of people whom I wish I could live with for a month and just soak in all your knowledge. I’ve made itty-bitty crude baskets in classes, but nothing so elegant as these. I love your site. I have been weaving baskets for a year now. It gets in the blood. I am learning new techniques all the time. Most of my material comes from our timber. Honeysuckle, buckbrush runners, virginia creeper, and grapevine. I made my first all honeysuckle basket yesterday with just raw material. I didn’t boil off the bark like I have done before. The frame and the ribs and weavers are all honeysuckle. I used some crazy shaped vines that were braided together as they grew and formed my two hoops for the rib basket. It was a blast to make and it was done in a few hours, with some interuptions. I had harvested the vine that morning so I didn’t even have to soak it . I have been making free form rib baskets with hand harvested hickory bark and old fabric strips from old, or yard sale clothing. They are all unique. We live in the heart of the Missouri Ozarks and I am learning all the old traditional folk ways I can. I love caning log chairs that I make with logs that are harvested from timber cuts on neighbors land. The hickory bark is my caning material until I run out and then I use purchased material. Spring will bring the sap on and I will be busy peeling hickory logs for bark for this year. We try very hard to live off the land and I love all your tips and articles. Gosh, how beautiful are they?